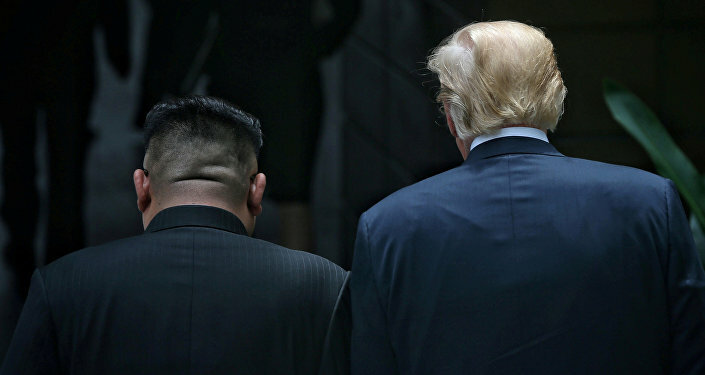 Donald Trump gave his North Korean counterpart Kim Jong-un a rare peek inside his presidential limousine as they walked out of the Capella Hotel on Sentosa Island, Singapore. The US president showed off his $1.6 million armored car, dubbed The Beast, to the North Korean leader immediately after their working lunch as the two bonded. As the video reveals, the two heads of state approached the vehicle sporting the US flag, and Trump briefly demonstrated the car from the inside. — Dan Linden (@DanLinden) 12 июня 2018 г. The Beast, or Cadillac One, which weighs eight tons and has 20.3-cm thick steel doors, was designed to keep Trump safe from any kind of threat, including biological and chemical attacks. In addition, the armored car’s front windshield is bulletproof; the bodywork is military grade and 12.7-cm thick, while the fuel tank is explosive resistant. Among other peculiarities there reportedly are steel-rimmed tires, tear gas launchers, night vision cameras on board, pump-action shotguns, an oxygen system in the event of a chemical attack, as well as life-saving medical equipment, including blood bags for an emergency transfusion, first aid kits, in case the president is injured. Despite its impressive features, the Beast fleet suffered several failures: in 2013, one of the cars broke down when a driver put the wrong type of fuel in it while President Barack Obama was on a trip to Israel. Prior to that, in 2011, a car got stuck on a speed bump outside the US Embassy in Dublin due to its inability to maneuver as Obama visited Ireland.